Bop & Giggle Frogs is rated 4.3 out of 5 by 47. Get the giggles going with just a bop! 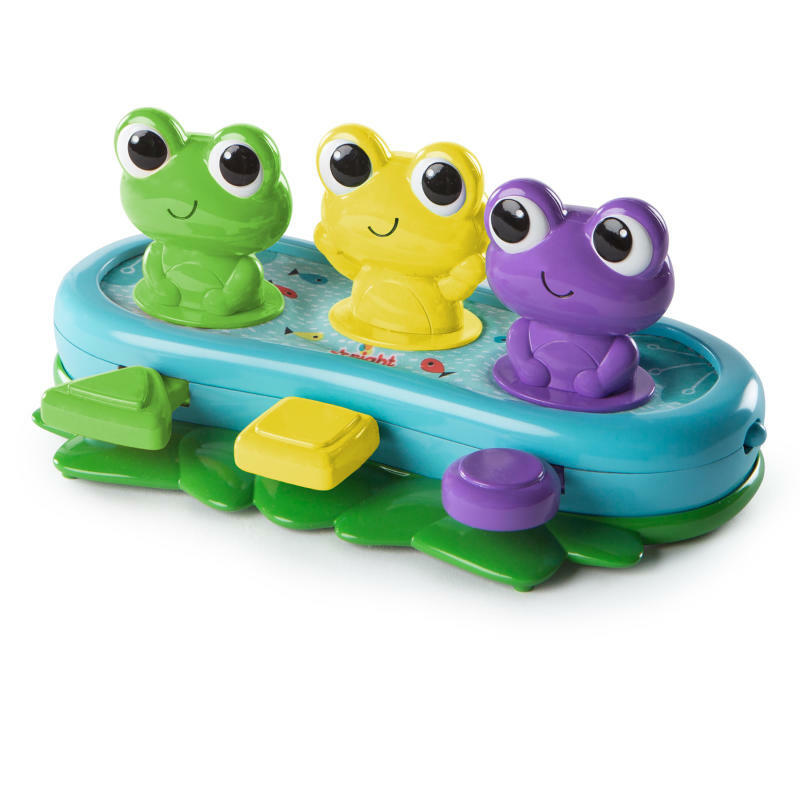 With the Bright Starts Bop & Giggles Frogs, your baby will hop right into fun. Silly songs and sounds play as baby taps each of the different shaped paddles, and the frogs wiggle and bounce along! From tummy time to sit and play, these silly pals will fill your baby with belly laughs. Don’t forget to jump in on the action! Play along with baby and create un-frog-gettable moments and memories. Dimension (in) 9.5" x 5" x 4"
Rated 4 out of 5 by AmandaP from Simple but entertaining This toy is so simple, but provides lots of giggles when used. Little ones love it but don't necessarily play with it for very long because it doesn't do much. I'd recommend for 2 yrs or younger. Rated 4 out of 5 by Dmb1031 from Cute My son laughs at these little frogs. They make cute little noises. Great tummy time toy to help entertain. Also love that it has volume control and on/off switch. Rated 5 out of 5 by Mellie2015 from The calming sensation This toy occupies my little one with the bop and giggles of the frog. We are a happy family during play time. Rated 4 out of 5 by Edilworth12 from Very Engaging! My kids (2 year old and 1 year old) both couldn't wait to get this toy out of the package and despite their age difference they both love it! Little one can play with it and older child uses it like a piano! Rated 5 out of 5 by Megan2724 from Both my 4 year old and my 2 year old love to make music with this toy! Great design! Rated 5 out of 5 by Megan2724 from Both my 4 year old and my Both my 4 year old and my 2 year old love to make music with this toy! Great design! Rated 4 out of 5 by Haleykali from Great Toy This is a great toy for babies. It is entertaining, small and easy play with. Its also easy to bring places. Great for 9-15 Months old.